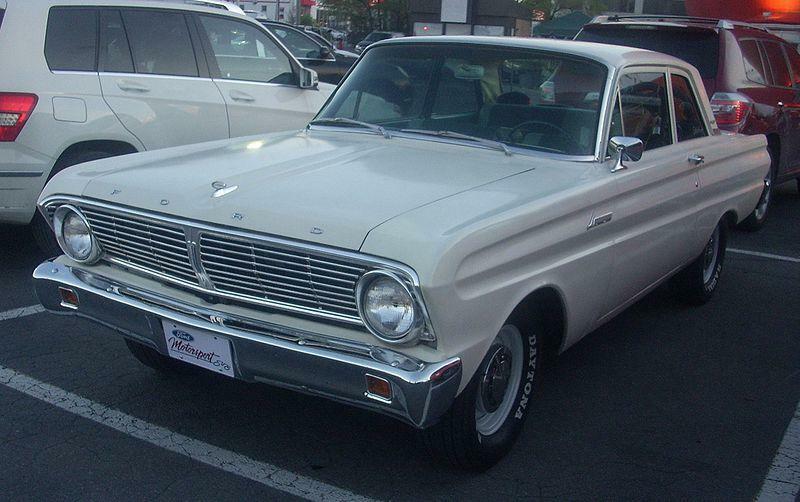 The reskinned 1964 Falcon was available with the underpowered 144 six, the adequate 170 six or a new-for-1964 bored-and-stroked 200 cubic-inch “small-block” six transplanted from the Fairlane line. A 260 V-8 also was available in any Falcon; putting out 164 horsepower in a car weighing in at 2,500 pounds meant some serious “giddyup.” This car was the inspiration for the Mustang in April 1964, and it shared its bones with the original 1960 Falcon. The 1964 Falcon’s look was new: boxier and classier, with sculpted body sides expanding toward Ford’s trademark round taillights. The Falcon suddenly found itself out on racetracks and drag strips, instead of just grocery trips with mom and kids. The 1965 Falcons were available with a 289 cubic-inch small-block V-8 they shared with the Fairlanes and Mustangs. A V-8 four-speed manual was also an option. Beginning in 1965, the 200 six also featured seven main bearings instead of four, which made the engine far more reliable and smoother. Click here to read Hemmings Motor News' Buyers Guide for the 1964-1965 Ford Falcon Sprint.